Police clashed with anti-coup protesters in Kharkov, east Ukraine, Monday night in an effort to push the activists back from the city administration building. This comes after the rally proclaimed independence of the region from Kiev. Police reportedly used fire-hoses, stun grenades, and tear gas to push the crowd back from the building. In response, protesters threw several Molotov cocktails at the building and set a pile of tires on fire. The blaze soon spread to the first floor of the building. Activists at the scene said the law enforcement officers who used force against protesters had been deployed from western Ukraine. According to some witnesses, the violence was initially triggered by a group of provocateurs. Earlier in the day, pro-EU demonstrators clashed with supporters of the federalization of Ukraine. Eventually, a group of local police outside the administration building moved in to push protesters back, allowing fire crews to extinguish the blaze. The building was slightly damaged by the blaze, and several windows were broken in scuffles. Witnesses at the scene reported that demonstrators were still in control of the government building after the tensions eased. Earlier on Monday, speaking through a loudspeaker in the hall of the city’s regional administration building, an activist could be heard saying that the issue of Kharkov becoming a sovereign state independent from Ukraine will be decided by a regional referendum. A crowd of demonstrators responded to the statement with cheers. 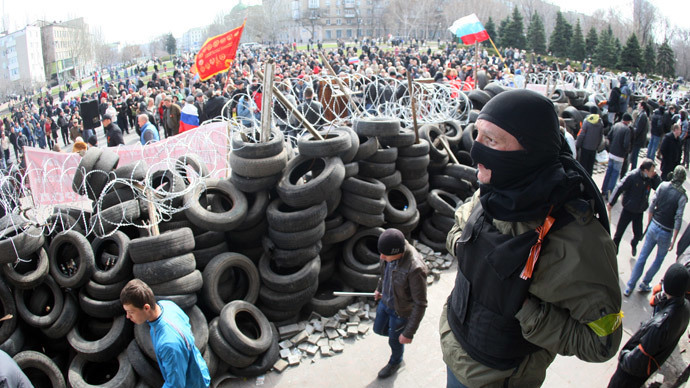 Kharkov protesters erected barricades around administrative buildings and the regional headquarters of the Security Service of Ukraine on Monday. Brief clashes between supporters of the federalization of Ukraine and pro-EU demonstrators were reported in downtown Kharkov. Protesters on both sides reportedly used firecrackers and stun grenades. Anti-coup protesters in Donetsk proclaimed on Monday the creation of a People’s Republic of Donetsk after seizing the local administration building on Sunday night. The situation remains tense in the port city of Mariupol in the Donetsk region, where pro-Russian activists on Saturday stormed the Prosecutor’s Office building, demanding the release of detained “people’s mayor” Dmitry Kuzmenko. A demonstration against political repression in Ukraine is also being held in the southern regional center of Odessa. The clashes also erupted in the southern Ukrainian city of Nikolaev after at least 300 activists attempted to storm the city administration building. 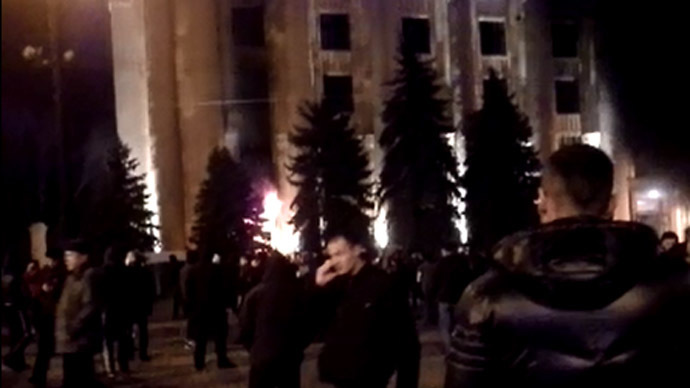 The protesters were also trying to remove the Ukrainian flag from the administration building. Police reportedly used rubber bullets to push the crowd back from the building. At least 15 people have been injured, with 11 of them were admitted to hospital, and more than 20 arrested, the city’s Health Department reported. In a rare incident, Dnepropetrovsk city authorities moved to negotiate with the anti-government activists. According to the region’s vice governor, Boris Filatov, both the “left-wing” and the pro-Russian protesters agreed to refrain from “calls for separatist actions.” In return, the authorities said they will let the activists use some cabinets in the administrative buildings for their “meetings and work,” as well as provide them with “free access” to local printed media.